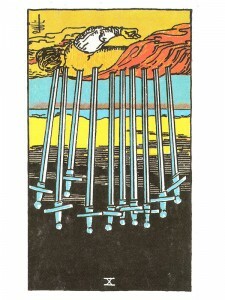 Ten of Swords (R) says examine things from every angle and thoroughly pin down all the aspects of your situation. You are blocking reality, seeing only what you want to see. Fearing that everything is going to come tumbling down around you. Stretch yourself in your search for knowledge and with diligence you will develop wisdom. When you are coming out of a bad situation – expect new and positive vibrations! A Karmic lesson has been completed and there will be steady improvement now. When you are suffering from the aftermath of deep personal hurt – you need spiritual guidance. Go deep within and seek “inner” counseling – allow yourself to experience the peace – let go and rest in the presence of your “inner” strength. You are never alone and you can trust in the assurance of their guidance and protection. Here are mental conclusions that are not correct in the given situation and the struggle of the ego continues against the input of the intuitive/spiritual. At an extreme, the ego can be very much out of control and causing damage to yourself and others. Mental immaturity – old-fashioned, raw egotism. Little or no mental longevity, lack of identification with universal mind. Next to Hermit: There is great need for deep thought – consider all future activities thoroughly. In the first position: You must solidify your control over the lower selves in this lifetime. In the second position: You may be relying on some aspect of your intellectual armament that is not well-suited for you. In the third position: The catharsis from mental to spiritual is in progress. What pain there may be is yours and yours alone – enjoy it now as it will pass and you will forever miss it, for it is sweet pain indeed. This is the pain of separateness which you are leaving behind. By going easy on others, you will be going easy on yourself. In the fourth position: Balancing the inner and outer aspects of God are especially important on this path. One extreme leads to separation, the other to over-identification. In the fifth position: Too much or too little conscious attention has been paid to the subject of transformation. Try to get a grip on what all the knowledge you have been given is for. In the sixth position: Yes, you are a pretty smart cookie, but how are you using it in your relationships? How are you using your talents? In the seventh position: This archetype in this position may just be what the word temptation was coined for. You have achieved such a mass of knowledge and have been so successful in the use of your willpower that you may be on the threshold of thinking that the power of mind is all you need and since you have that. In the eighth position: Because this transformation at the upper levels does have physical repercussions, your body may have some difficulty assimilating the changes. Rest assured that these are growing pains much like those experienced as a teenager and the discomfort will pass. Exercise and bodywork are especially important at this time. In the ninth position: Difficulties with too much or too little of this archetype may be painful and trying on your relationships. Or, it may be affecting your energy and ability to create. In the tenth position: There may be some rough spots in your transition but they will be met by you confidently and with dispatch for you are being called forward and must be ready.